Q. Could you explain the latest technology applied to the development of balloons? We aim to develop technology that allows us to fly larger balloons at higher altitudes and for longer periods. If you want to carry a payload higher without reducing its weight, you need a bigger balloon. However, you cannot just make the balloon bigger, since the balloon material itself adds more weight, and this would be very inefficient when launching a small payload. To solve this problem, we have been studying how to reduce the thickness of the material used to make the balloons, in order to reduce their weight and allow them to reach higher altitudes. Through collaboration with manufacturers, we have produced a polyethylene film that is 2.8 micrometers (2.8 thousandths of a millimeter) thick. 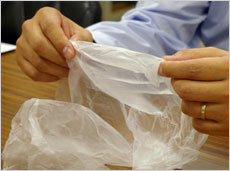 This is the world's thinnest polyethylene film for balloons - about one sixth as thick as a plastic grocery bag. In 2002, with a 3.4-micrometer-thick polyethylene film balloon, (20 percent thicker than the new film), we set a world record by flying an unmanned balloon to an altitude of 53 km. It flew beyond the stratosphere, reaching the mesosphere, and has already been used to observe ozone in the mesosphere. We are now trying to develop a 2.8-micrometer-thick film balloon to reach an altitude of 55 km. In Japan, typical flight times for balloons range from a few hours to about a day, depending on the purpose. The flight time of balloons currently in use, called zero-pressure balloons, is limited by altitude compensation during night flight. For zero-pressure balloons, helium gas is released from the bottom of the balloon to equalize the pressure of the gas inside with that of the atmosphere. But the change in temperature between day and night causes expansion or shrinkage of the gas, causing the balloon to gradually lose altitude. Ballast is dropped to maintain a constant altitude, but the amount of ballast that can be loaded on the flight is limited and thus, naturally, so is the flight's duration. So if there is no fluctuation between day and night, a balloon flight can last longer. That's why it helps to launch balloons at the North or South Pole, where the sun doesn't set for six months of the year. 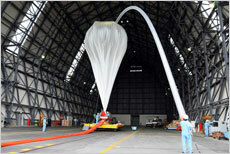 In fact, JAXA and NASA have flown the Polar Patrol Balloon for more than 40 days at a time. So, how can we achieve an extended flight in a night-and-day environment? The answer is to stabilize volume regardless of the diurnal temperature change. We are developing technology for a superpressure balloon – a balloon that is sealed and slightly pressurized inside to prevent it from shrinking as the gas cools at night, in order to maintain constant buoyancy and a stable altitude. This balloon will require a more durable thin film and a new balloon structure, because unlike zero-pressure balloons, a superpressure balloon is pressurized from inside. We are also developing technology for a larger balloon. The volume of today's biggest balloon is more than 500 times that of Japan's first balloon - our technology and techniques have greatly improved since then. At launch, we control the balloon's ascending speed by supplying only the required amount of helium gas. But as a result, strong force concentrates on the balloon's top. If we used a thick durable film to withstand such a force, the balloon would be very heavy, so the top is reinforced with layers of a thin film. The thermal melt-bonding technique for thin polyethylene film has improved enough to guarantee that as many layers of film will bond together as necessary. Someday, by integrating such examples of Japan's latest technology, I'd like to carry out scientific observation in the mesosphere, and also to implement an extended flight lasting more than a month. Q. What is the history of balloon development and experiments in Japan? Japan's balloon history began around 1960, when some universities started using them to study cosmic rays and the atmosphere. In 1965, the Institute of Space and Aeronautical Science at the University of Tokyo (now JAXA's Institute of Space and Astronautical Science) founded its balloon engineering section to both develop and operate balloons. Back then, balloons were released from Ibaraki prefecture and Fukushima prefecture. But people soon realized the necessity of having a permanent balloon launch field, and started the Sanriku Balloon Center in 1971, in Sanriku-cho (now Ofunato city), Iwate prefecture. A great number of balloons were launched from there. Balloon-borne experiments are good for direct observation of the stratospheric atmosphere. About every two years since 1985, samples of the stratospheric atmosphere at altitudes of 20 to 30 km have been frozen with liquid helium and returned for analysis. This has revealed the increase of greenhouse gases, such as carbon dioxide, over the last 20 years. We have also observed thunder at high altitudes, and a change in ozone density in the stratosphere and the lower mesosphere. I think balloons are ideal for such in situ observation. In the upper stratosphere, where air is thin, we are conducting astronomical observations with X-rays, gamma rays, infrared rays, and cosmic rays. Balloons have also been used for experiments in astronautical engineering, such as environmental tests of observation instruments for the International Space Station and scientific satellites, engineering tests of atmospheric entry vehicles, deployment tests of solar sail membranes, and microgravity experiments. For microgravity experiments, we successfully achieved a microgravity environment for more than 30 seconds by letting the experimental system freefall from an altitude of 40 km. Over its lifespan, the Sanriku Balloon Center launched 413 heavy balloons. Scientists who were part of these experiments later became contributors to Japan's satellite program, and a number of technologies developed for balloon-borne experiments have been applied to scientific satellites. I believe that balloon-borne experiments conducted at the SBC are a cornerstone of Japanese space science. Demand for larger and heavier payloads has grown, as researchers hope to get as much data as possible from each observation and to observe rare phenomena. We needed larger balloons, but the Sanriku Balloon Center could not accommodate the demand because of the size of its launch pad (160 m x 30 m). There were also safety concerns, as there were houses, roads and train tracks below the balloon's flight path from the SBC to the ocean. And we had a more significant problem. The westerly winds have moved north in recent years, possibly due to recent changes in the global environment, making it difficult for us to get a stable jet stream, which is essential for an extended balloon flight in Japan. Due to these circumstances, we decided to build a new site at the Taiki Multi-Purpose Aerospace Park in Hokkaido. The wide, open park faces the ocean, and the low population density in the area reduces safety concerns. We will be able to get more stable jet streams, as Taiki is located further north than Sanriku. Besides these geographical advantages, there was the additional advantage that the locals were already accustomed to aerospace experiments, since JAXA's large-scale airships and unmanned spacecraft had been tested in their town. So the Sanriku Balloon Center was closed in 2007, and the Balloon Operations Building was built in the aerospace park. We started balloon-borne experiments in Taiki in May 2008, and in August, we successfully performed our first test balloon launch, control and recovery. The park area that JAXA will use for experiments was named the Taiki Aerospace Research Field. Now that we have earned the local population's understanding and cooperation, the fishermen in town will help us with recovery on the sea. Balloon-borne experiments are finally going to start on the new site in 2009. I'm looking forward to the scientific achievements that will be made in Taiki. Q. 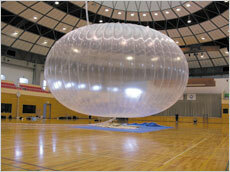 Can you tell us more about the benefit of performing balloon-borne experiments at the Taiki Aerospace Research Field? A balloon made with a thin film can be damaged if a strong wind gusts during launch preparation on the ground, while the balloon is being filled with helium gas. 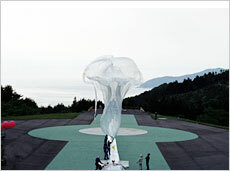 The Sanriku Balloon Center was located in the mountains, so there was always a chance of a sudden gust of wind. Our dream was to have an indoor facility, so that we could eliminate this hazard, and also could keep the balloon indoors while waiting for good weather conditions. In Taiki, we have taken over the huge hangar that had been used in experiments to develop an unmanned airship, the Stratospheric Platform. To conduct balloon-borne experiments, we recently acquired the Sliding Launcher for large balloons, which allows us to inflate a balloon with helium gas in the hangar and slide it outside on rails for launch. 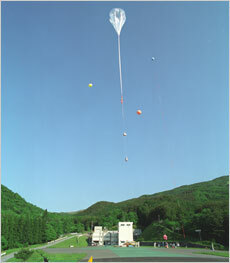 This method and facility for balloon launches are unique to Japan.